iBanking solution from New Frontier Group, which is innovative, intuitive and interactive banking online solution is nominated by an international jury of ICT experts to enter the next round of the 2013 World Summit Award (WSA) in e-Business & Commerce category. iBanking will compete against almost 500 outstanding e-Content products and applications from 168 countries in front of the WSA’s Grand Jury from August 29-31 in Estonia’s capital city, Tallinn. In the first round of the international competition, an online jury will now valuate the ventures, creating a shortlist of 15-20 projects in each of the eight categories. After this, in a three-day process in late August, the WSA Grand Jury, consisting of international renowned ICT experts and industry leaders, will meet in Tallinn/Estonia to evaluate the submissions from the remaining nominees and select the 40 best products. The jury members of the Grand Jury come from all continents and have backgrounds in the creative industries, telecommunication, advertising, journalism and research, as well as in teaching. The jury will be hosted by national partners such as the Estonian ICT Cluster. After the selection in Estonia, the 40 WSA winners will get the chance to present their products at the WSA World Congress in Sri Lanka, Oct. 23 to Oct. 25. The event will offer a platform for high level experts, industry leaders and government representatives to discuss innovation in mobile content. At the event, an on sight jury will again evaluate the products to select eight overall winners: The WSA Global Champions 2013. 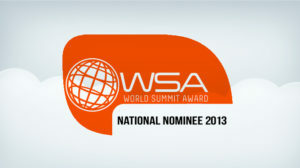 More details about WSA: www.wsis-award.org, facebook.com/WorldSummitAward and twitter.com/WSAoffice.